What does your financial “afterlife” look like? An Employee on one of our funds passed away in January. He nominated 3 of his children and his girlfriend. When he passed, he had 4 children… the Pension Fund Trustees founded that only the 4 children will benefit from his Approved Benefits. This caused a lot of conflict in the grieving process for the family. Whaaaaat??? But how, she has nominated after all?? 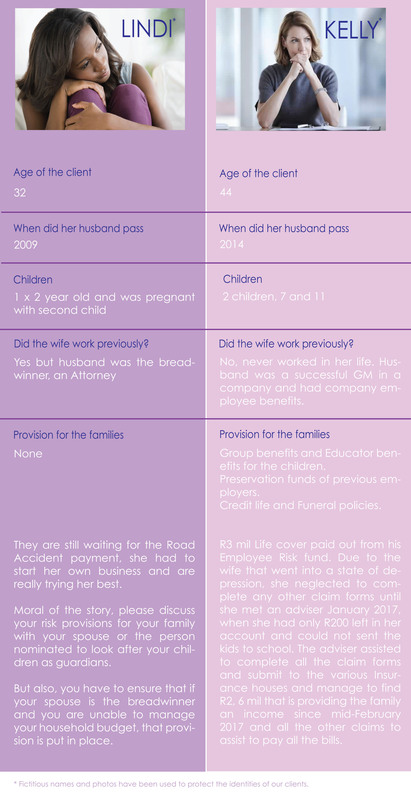 The Family Provision Act covers the legal obligations of the testator (deceased) to provide for certain individuals. those with an interdependent relationship with the testator. A claimant must prove that the testator did indeed have a responsibility to make a provision for them. The first stage is to confirm whether the testator has given adequate provision for the education, maintenance, advancement and/or support for the claimant. If the provision is found to be inadequate, the court will determine whether extra provision from the estate is to be made, and if so, to what extent. Do you want your funeral to be remembered as a lovely memorial for your loved ones, where the best tuna mayo sarmies were served or do you want the legacy to be “that time Aunt Martha threw her high heeled shoe at Johnny resulting in a trip to the ER” and permanent family feuding. To avoid this type of conflict in your absence, update your Benefit statements on a regular basis. There are two different Types of Benefit categories you are required to nominate beneficiaries for. Two female clients both lost their husbands. “The moral of the story is this; As important as it is to remember to pay your electricity bill and update you address with utility suppliers when you move, it is even more important that you get an adviser to assist you to ensure you make sound financial decisions and that all your paperwork is up to date and in order, covering all your loved ones.